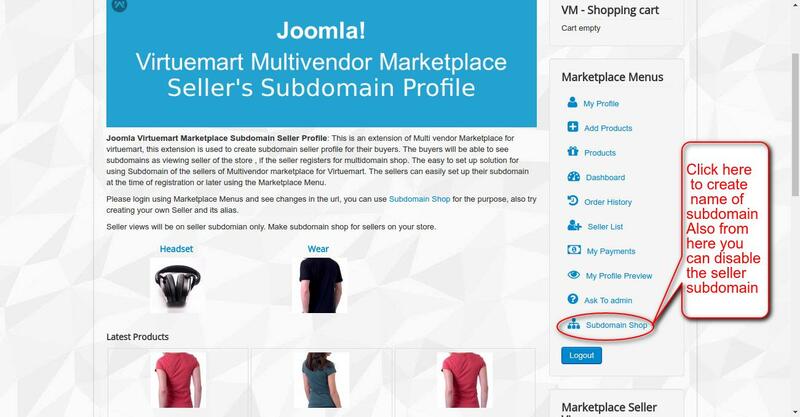 Joomla Virtuemart Marketplace Seller Profile Subdomain is a splendid extension of VirtueMart multi-vender marketplace. It allows the seller(s) to create a sub-domain at the time of registration in the marketplace. Virtuemart Marketplace Seller Profile As Subdomain permits to create sub-domains at seller end. The seller can insert any keyword into the URL without creating and registering a new website. This helps to reduce committing blunders of using keyword-rich domain names that are entirely different from the type of business. Well integrated and acting as a supportive add-on of Multivendor Marketplace. Any sub-domain can be used as seller alias. Easy changing of sub-domain alias from Marketplace menu. Login and other sessions across all sub-domains. Sub-domain entry with the help of A-Record. A-Record(Address Record) helps to make a wild card entry and point all sub-domain to a particular server. Sub-domain feature option on marketplace registration and Marketplace Menu. A seller with sub-domain enabled will have all views on sub-domain. A plugin gets installed and enabled automatically in the admin end. The feature of the subdomain is available on Marketplace Seller Registration. The functionality to edit the sub-domain alias is available. A separate field has been provided in the Marketplace Menus as shown below. Click “enable” to make a sub-domain for views. Enter the name of the sub-domain alias.